As reported by Stephanie Crets of Internet Retailer, Etsy decided to raise its transaction fees from 3.5% to 5%, to invest in marketing and attract new buyers for its platform. 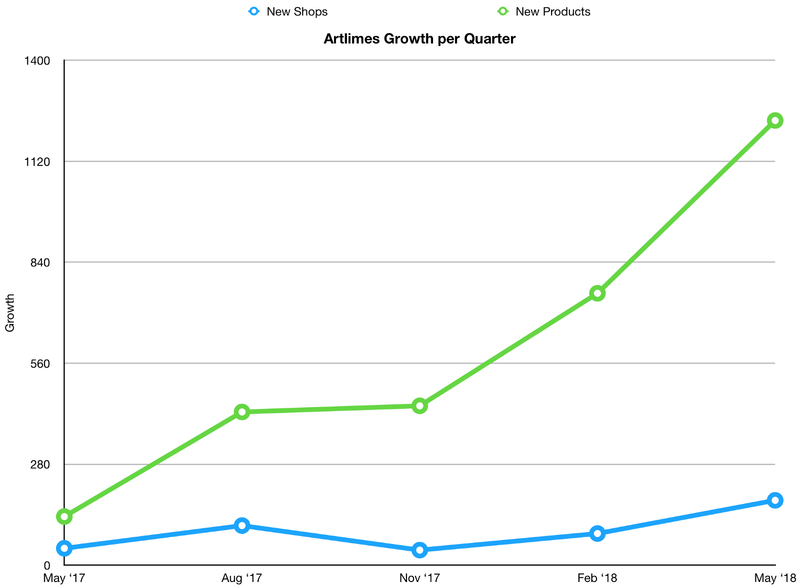 Artlimes.com on the other hand, the most innovative marketplace to buy and sell art, jewellery and design items, remains free to use and continues to grow at an astonishing rate of well over 40% since January 2018. Artlimes launched its Beta version in May 2017, and its official MVP version was ready in January. Artlimes now has a catalog worth well over £15M ($19.9M) in products from sellers spanning across more than 30 countries. Artlimes has a very similar model to Etsy, in that it charges 3.5% of the sale price, however its transaction fees remain at 3% globally, with automatic payouts in the seller’s local currency. Artlimes has promised long before Etsy to deliver two more packages to its sellers, which will remain free and will be set at 5% and 10% commission of the sale price. As it stands, the Basic package on Artlimes offers sellers free listings, the ability to sell limited edition prints of their original artworks or photographs, which are delivered with Certificate of Quality provided by Artlimes, along with features such as free shipping, carrier pick ups, shipping labels printed directly from its platform and a number of other features, which will be released this year. The Advanced package, which will be available by the end of 2018, will allow buyers to use an extensive number of marketing tools to promote their catalogs, but also to take part in auctions with products remaining on the platform for a long time. Unlike Etsy that deletes products on its platform after 4 months, Artlimes has a goal to help sellers maximise their revenue as quickly and as efficiently as possible by offering multiple sales channels. The Expert package will be released in 2019 and will include all features from the other two packages and target sellers who need even more features to promote their products. “We are changing how people buy and sell art online by combining art and technology” said Lorenzo Campanis, Founder and CEO of Artlimes. “Our ShowroomHD gives buyers a brand-new experience to visualise artworks in real size in different rooms and easily purchase art they love”. The company has also been approved for SEIS and EIS tax relief. Another main difference between the two platforms is that Artlimes invests heavily in making its technology open source. The company has been working closely with Reaction Commerce in California on a number features and has been a loyal contributor to Reaction’s roadmap even before launching its beta version. Artlimes has promised to bring sellers and buyers a number of advanced features using Artificial Intelligence, Virtual Reality and introduce Blockchain Certificates of Authenticity to users of its platform. The technology used in the platform is so advanced, that the company set up a digital agency called artlimes.io, servicing clients in advanced internet technologies such as: Virtual Reality, Artificial Intelligence, Machine Learning, Human Machine Interfaces, Blockchain and the Internet of Things. Artlimes combines the latest technology and solves the problem of high commissions when buying, selling and shipping artworks of all price ranges globally. Sellers can use the platform for free and pay the lowest commission in the market. Lorenzo is a pioneer in web technologies, an artist and founder and CEO of Artlimes, the next generation platform for buying and selling art online. The most innovative global marketplace to buy and sell art, jewellery and design online. Artlimes has the best online technology and lowest commission on the market. The platform has very competitive prices for highly curated pieces, making art accessible to anyone.